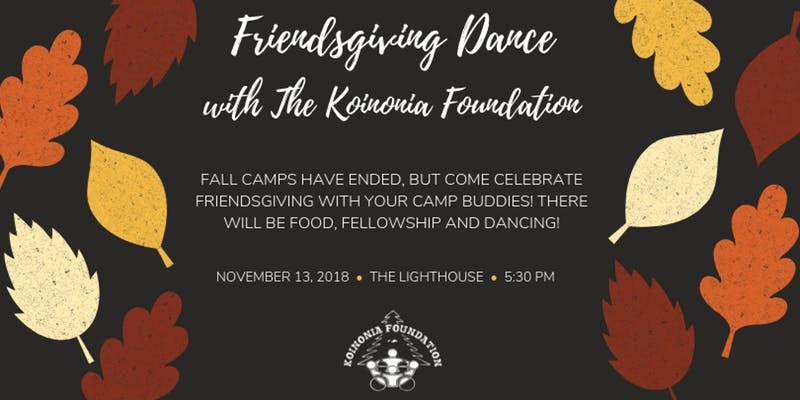 Fall camps may be over, but come celebrate an early Friendsgiving with your Koinonia Family! We will gather at The Lighthouse and eat Thanksgiving food until our bellies are full and dance until we drop! The Koinonia Foundation is pleased to partner with New Life Church to bring you this night of food, friendship and dancing! Parents and Families are welcome to join. Please include participant and family attendance in registration numbers. Looking forward to celebrating Friendsgiving with our Camp family!